On Friday, it didn’t look like Joe Bufford was going to have a very good weekend. He got into the wall and had to send some crew members back to Franklin (TN) for some parts. “Then I was trying to get up off of two and the thing just smacked the wall again. I pulled it in after that. I told my guys I didn’t want to tear the car up any more. I have been in the wall twice this week because of slow cars being in the way. Whatever they got worked out well. During Saturday’s qualifying, Bufford turned in the second quickest time of all of the cars in attendance, locking him in the show and allowing him to sit out the heat races. At the start of the 150-lap feature, Bufford got the jump on pole sitter Frank Deiny Jr. and led lap one. He also led lap two and lap three and then on. In fact, Bufford led until lap 37, when Deiny Jr. passed him. From there, things went downhill very quickly. “Lapped cars just got in the way,” said a dejected Bufford after the race. “It is so fast here. Things happen really fast. 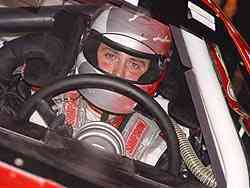 I brushed the wall trying to get around the 87 car (Jackie Buckner). Next thing I know, Frank Deiny jumped by me. Those were the words uttered by Frank Deiny Jr. after the race. That was the first thought that went through Deiny’s mind when his right front tire went flat while dominating Saturday night’s Food City 150. Frank Deiny Jr. was fighting a cold all weekend, but he was feeling a lot worse after the race on Saturday night. sick all weekend long, and celebrating in Victory Lane would have been a good remedy. “I’ve been sick all week, but that made me feel a lot worse. My guys did a heck of a job though. We were running fast times all night long. We were fast during long runs, short turns and off restarts. We were pretty good. Outside of race winner Josh Adam’s drive to win the Food City 150, the most impressive run of the night might have been that of young Kyle Grissom. 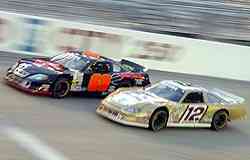 Grissom, the son of former NASCAR Busch Series champion Steve Grissom, is leading the UARA points in 2005 and has been impressive as of late. That impressive streak only got better following Bristol, where Grissom started 20th and finished third, staying out of trouble and looking like anything but a rookie. Kyle’s dad has plenty of experience on Bristol’s high banks in both the Cup and Busch Series. So Kyle used that to his advantage for Saturday night’s event. And Grissom loved that place. 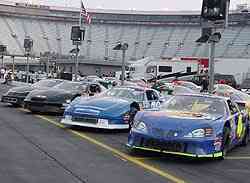 The Food City 150 at Bristol Motor Speedway proved to be a very high attrition race. With 32 cars taking the green, there were just 14 running at the end of the night. There were plenty of problems. And those problems weren’t just accidents. Wade Day, Jason York, Ashley Huffman, Leister Lesneski, Jackie Buckner, Keith Stiltner and Mark King were some of the drivers whose days ended early. Lester Lesneski's #45 was part of the big attrition count on Saturday night. UARA points leader Matt McCall added his name to the list of “drivers who ran up front but had problems” on lap 115. Matt McCall's car was one of the op-four qualifiers that were locked in. None of them were a threat for the win at the end of the race. “We had a tire going down there,” said McCall. “I was just going to try and ride it out and hope a caution came out. I didn’t have any tire left though. We didn’t want to tear anything up, so we came in and put a tire on it, but when the tire was going down, it dragged the sway bar arm and eventually ripped it completely off. So we just had to ride around. In his first trip to Bristol, McCall loved the half-mile, high-banked coliseum. 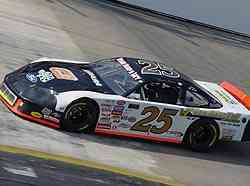 John Freeman had one up on the rest of the field heading into Saturday’s Food City 150. 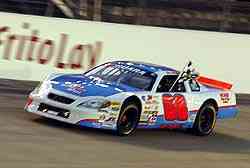 He was driving the car that won the same race last year when it was piloted by young Steve Wallace, Rusty Wallace’s son. Freeman, a long-time friend of Steve, purchased the car and decided to race it at Bristol, hoping to make it two-for-two. 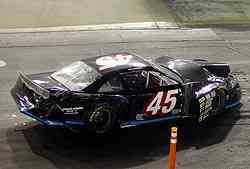 However, Freeman was also down one to most of the drivers in the rest of the field. 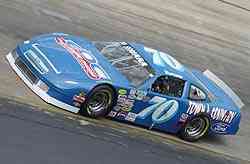 The 2005 season is Freeman’s first in a Late Model Stock, coming from the Legends and Thunder Roadster divisions. So to say that Bristol was a learning experience for Freeman would be an understatement, and his Saturday proved it. Freeman qualified seventh overall, placing him on the pole for the third heat race. The heat race proved to be a little wild for Freeman, who led the first lap, but slipped up the track and fell back on lap two, only to come back through the field and get up to the top-four before contact with another car late in the heat caused extensive damage to the nose of Freeman’s car. Freeman and the rest of his team got down toe business and worked on repairing the car between the feature and the heat race, with every available crew member doing their part. 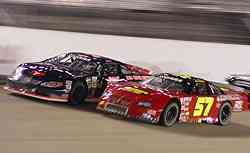 John Freeman (#57) races with the #7 of Ashley Huffman in the third heat race. Come feature time, Freeman was able to stay out of trouble and stay on the lead lap as other fell by the wayside. Unfortunately, it all came to a crashing halt on lap 86, when Freeman was involved in a multi-car accident with RA Brown, Dennis Queen and Lee Tissot. The night’s second-place finisher Deac McCaskill might have been a little bummed that he didn’t win the race, but this super polite guy was happy for something. Deac McCaskill won his heat race and was able to take a victory lap in his #08. McCaskill also had a lot of good things to say about racing at Bristol, considering how hard it was to race. Wade Day is a great racecar driver. He knows that, and a lot of other people know that too. He proved it back in 2004 when the relative unknown took the ASA world by storm, proclaiming himself to be one of the best on the circuit. Saturday night though, would be a night that Day would like to wipe from his memory. When his #96 dropped off the pace and retired from the event on lap 42, many figured some sort of mechanical problem bit the team. When asked what happened after the race a big smile came over Day’s face, but it wasn’t a smile of joy. “I’m kinda ashamed to say,” said Day, with a sly grin, when asked about what knocked him out of the event.. “I fell out of the seat. I put in about 100 hours this week getting this car ready and it just caught up to me I guess. I have never had that happen before. I was getting to where I was pulling on the steering wheel, so I just decided to pull it in. I thought I was going to wreck. Wade Day had some problems come race time. Ross Furr said after the event that we was pretty happy with his fourth-place finish at Bristol. And he should be too, considering what he and his team went through. “We got out there and got into the wall. That was a heartbreaker. We didn’t do anything but body damage though. enjoyable, considering his disappointing finish at Bristol last year. 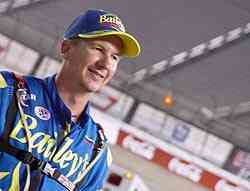 “When you are out there running, everything is happening so quick,” said Miller about racing at Bristol. “You really got to stay on your toes and really concentrate. Man, we love coming here. We came last year and didn’t have the results we wanted. We came back this year and worked even harder. Standing on the front stretch after the race, being interviewed over the PA system with the 8,000 – 10,000 fans in attendance was special for Miller too. Last year, Steve Blackburn made national news when he was in the race the NASCAR Dodge Weekly Racing Series National Championship. This year, he’s been a little quieter, but Blackburn was loud and clear at Bristol. His #69 started 26th in the 32-car field and finished eighth. Passing cars was not a problem for Steve Blackburn (#69) on Saturday night. Blackburn was quick to point out that his qualifying resulted in him having to pass 18 cars to get to where he finished.